Japan is not releasing any economic data but the US will publish Natural Gas Storage, NAHB Housing Market Index, Industrial Production m/m, Unemployment Claims and Import Prices m/m. The support rests at 112.750 with resistance at 113.440 which both lines are below the weekly pivot point at 113.770. 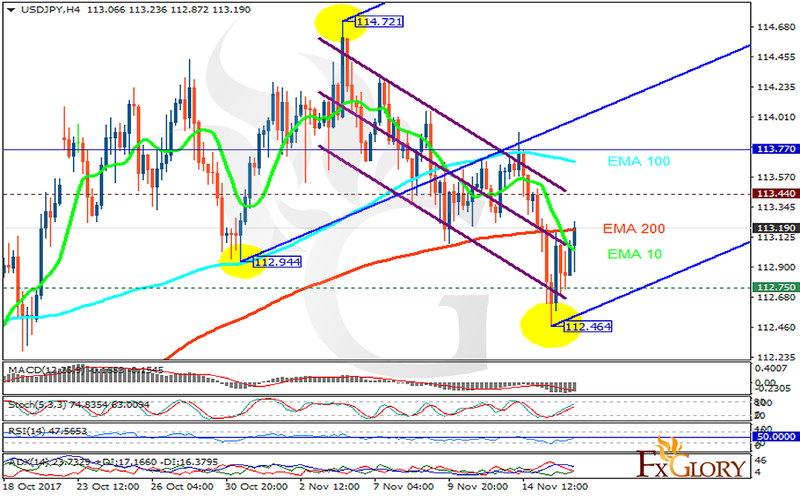 The EMA of 10 is moving with bearish bias in the descendant channel and it is below the EMA of 100 and the EMA of 200. The RSI is rising towards the 50 level, the Stochastic is showing upward momentum and the MACD indicator is in negative territory. The ADX is not showing any clear signals. Currently USDJPY is creating a correction pattern after the previous decline at 112.464 and if it breaks the resistance area, it will move within Andrews’ pitchfork targeting 114.5; otherwise, it will drop to 112.